As of 2019 Invisalign cost starts at $2,800. However, the average cost is between $3,000 and $4,800. A simple invisalign® case (minor teeth movement case that requires few months of Invisalign treatment) costs about $2,800 or slightly less, and $3,000-$4,900 for a full case in which the majority of teeth are involved. Invisalign treatment can last as little as 3 months and up to one year or more depending on the involvement of your bite alignment and crooked teeth condition. In general, our cost of Invisalign® is actually quite comparable with wire braces. Payment plans are available starting from $99 to $124 per month and up. While the vast majority of Invisalign providers in the dental industry take a traditional dental impression mold to capture the teeth (a negative imprint of the teeth), we specilaze in digital invisalign impressions to expedite treatment, lower cost and increase patient comfort. We have created a "Patient Invisalign Limited Guarantee" program to offer additional Invisalign aligners at no charge to our patients for up to 3 years after treatment for most invisalign cases. When we met our patients in real life, we listen to their past dental habits, previous dental work, and beliefs. We try to unearth their dental and life story, and to tell our own as certified Invisalign clinicians. The end goal is find out if we can bring these patients back to having straight teeth and give them a great smile. In this process of knowing each other during our 1-hour consultation we tap into the underlying reason patients have severely crooked and misaligned teeth and why they have decided to come to see us– to get to be the best version of themselves; a version they have always had within them that got lost along the way. We have a way to protect the cost of your Invisalign investment because predicting the way teeth may stay after treatment is completed can be challenging. Occasionally teeth might not stay in quite the right position, or sometimes a year or two after treatment teeth may shift. When this happens, we are here for you. As part of our "Invisalign Limited Guarantee", we are pleased to offer you additional aligners at no charge for up to 3 years after treatment for selected invisalign cases. We are a certified and licensed Invisalign® provider for the city of Fort Lauderdale and Plantation. The most obvious advantage of Invisalign® orthodontic treatment is cosmetic. 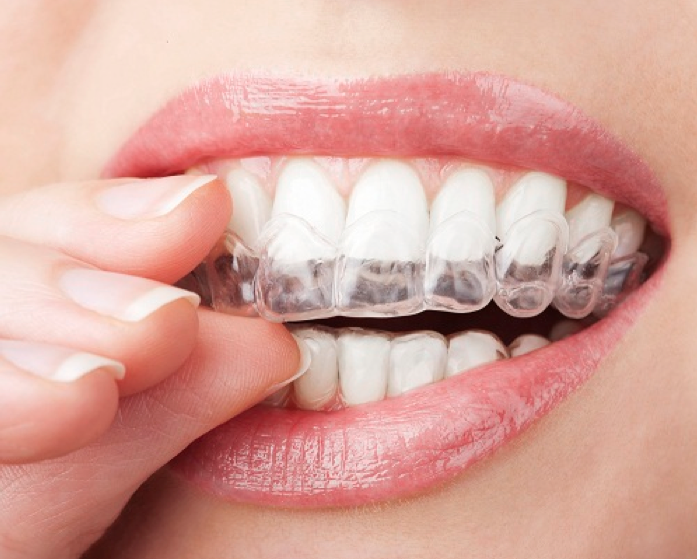 The aligners are transparent, therefore much more difficult to notice than traditional wire braces. This makes Invisalign® popular among adults who want to straighten their teeth without the look of traditional metal braces. In addition, the aligners are much more comfortable than braces. Due to the removable nature of the aligners, food can be consumed without the discomfort of metallic braces. Clinically, aligners avoid many of the side effects of traditional wire braces in most cases. Our Invisalign cost is comparable to the cost of wire braces. For simpler cases, Invisalign may cost under four thousand dollars. When you visit your dentist or orthodontist about Invisalign as a straightening solution for your teeth, he or she should be able to give you an estimated cost for treatment and help you determine what your insurance will cover. Because Invisalign is categorized as an “orthodontic” dental treatment, about 25% of Invisalign patients receive insurance compensation of over $500 on average, according to the most recent "Invisalign Patient Survey". As of 2018 many dental insurance covers from $500 to $1500 of the cost of Invisalign under orthodontia coverage. Some insurance coverage may be between 25% and 50% of the total fee. 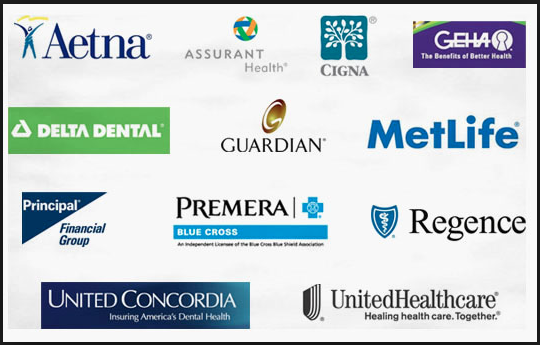 We take all major PPO insurance plans including Delta Dental, Metlife, Cigna, Guardian, AETNA, Humana, Assurant, United Healthcare, United Concordia, etc. Because we are in-network with most dental insurance plans we can maximize your savings for Invisalign® cost. We submit claims to the insurance company on your behalf and provide you with a breakdown of Invisalign treatment. The best way to learn more about your Orthodontic policy is to have our insurance expert Maria Sherman call and speak with your dental insurance company directly. This way we can help you determine the estimated out-of-pocket and assist you with a payment plan if you so wish. Many dental insurance plans cover Invisalign treatment just as they would other orthodontic treatments like conventional braces. Few insurance plans may cover up to $3,000 of Invisalign treatment. Our dental office, as a preferred Invisalign provider, working with all major insurance plans, and while most dental insurance questions can be answered easily and quickly, the question about "does my insurance cover Invisalign" takes more time to get an accurate answerer. The most common Invisalign lifetime limit is $1,500. Some insurance policy have a lower limit of about $1,000 and a few pay as high as $2,500 or more. Benefits are typically paid at 50% up to $1,500. Some insurances that cover Invisalign have a recurring annual deductible of $50 to $150 during the course of treatment. The typical Invisalign coverage of a lifetime $1,500 benefit is generally all-inclusive (includes records, active treatment, and retention). It may also include Invisalign-related procedures such as extractions. These Invisalign-related procedures may not generally be covered under regular dental benefits and the claim form should indicate they are “orthodontic/Invisalign-related procedures. Thus the claim form question, “Is treatment for orthodontics/Invisalign ?” is checked “yes” in the appropriate block. However, if the Invisalign-related benefits are paid out of general dental benefits, often the UCR is paid at 50% rather than 80%. The Invisalign lifetime limit is often in addition to the regular dental benefit limit for the vast majority of plans. In some cases, the maximum annual limit is fixed at $1,500 for both Invisalign and regular dental coverage in the same year. Thus, if the regular dental benefit is used, then the Invisalign benefit may be reduced dollar-for-dollar for that treatment period. In other cases, a maximum (for instance $1,500) is stated but only a portion is available for Invisalign reimbursement, even if the general dentistry portion is not used. For instance, the Invisalign benefit is limited to $500 of the $1,500 total benefit. With so much variability of benefits, a call to determine eligibility and benefit coverage is a must for each case. Invisalign ® cost for top teeth only. Invisalign cost about $2,800 for top teeth only. However, many times is not possible for the patient to place aligners on his or her top front teeth only because such treatment depends highly on patient’s bite condition. We would need to conduct a thorough examination of the patient’s mouth to see what would occur if the aligners were only working to straighten the upper layer of teeth. Some patients are eligible to place aligners on the upper teeth only, while some patients will need the full treatment. Only a consultation can determine the exact cost for patients having Invisalign for top teeth only. Invisalign cost without insurance is usually slightly more than braces. The average price is between $3,800 and $4,800 for a full Invisalign case in which all teeth are involved. However, cost varies among certified dentists and orthodontists. Prices may also vary depending on where you live and how involved your Invisalign orthodontic treatment may be. As of 2018 Metlife insurance covers $500 to $1500 of the cost of Invisalign under the orthodontic plan. A few Metlife insurance policy may cover between 25% and up to 50% of the total fee. Insurance plans with Invisalign coverage are available. Prior authorization may be required for certain specialty care treatments like orthodontics. Aetna insurance cover about 50% of Invisalign cost up to $2500. In general, many Aetna PPO insurances cover $500, $1000 or $1250 for Invisalign. Age limits affect the Invisalign benefits under Aetna Insurance. Invisalign age limit: When the plan includes an Invisalign age limit, Invisalign must be placed on your teeth before reaching your plan's specified age limit. Aetna Dependent age limit: Invisalign benefits will be available until your dependent reaches your plan's specified age limit. No benefits will be paid after that, even if the treatment is not complete. Not all Aetna insurance plans include orthodontic and Invisalign coverage. Please see your plan documents for coverage details. You may also call Member Services at the number on your ID card or Maria at our practice. Switching from DMO and HMO to PPO Invisalign benefits are subject to the new plan's orthodontic maximum. If the new plan doesn't cover orthodontia, no benefits can be paid towards Invisalign. If you switch back to the DMO and HMO plan, the months you were covered under the Indemnity or PPO plan will be deducted. That means no benefit is paid for that time period. Cigna Insurance PPO plan covers Invisalign in progress, subject to your specific plan's limitation. The Invisalign in progress benefit is calculated based on the coinsurance level for Invisalign treatment and the number of months of treatment remaining after your effective date. Cigna PPO Plan pays 50% to a lifetime maximum of $1,000 for Invisalign. Invisalign payments made monthly are $60 (50% of $120) x 12 months for a total of $720. Keep in mind that patient is still liable for the provider’s original case fee because that was the original financial agreement between the patient and provider. For 24 months of treatment. It's easy to look up your Delta orthodontic Invisalign benefits online, including your invisalign dentist network, maximums orthodontic, annual deductibles and copayment percentage for invisalign coverage. However, it is best to learn more about your Orthodontic policy by having our Invisalign insurance expert Maria Sherman call and speak with your Delta insurance company directly. This way we can help you determine the estimated out-of-pocket. Delta Invisalign costs depend on the services you need, but our Delta Dental in-house insurance specialist can help estimate costs before treatment begins. As a preferred invisalign provider, we can submit a pre-treatment estimate. We’ll send an overview of the total treatment cost, including how much your plan pays and your share. Invisalign costs depend on the services you need. We can create an orthodontic Invisalign estimate of costs, name a “pre-treatment Invisalign estimate.” If you agree to proceed, we may create a treatment plan with the associated copayments amount and fees. Invisalign ® payment plan starts between $99 and $125 per month with no down payment. Simple patient financial to move improve your smile. Should the cost of Invisalign prove prohibitive for an individual, there are options to consider that can put Invisalign within reach. We have found that Lending Club online application is simple, fast and easy. It takes just minutes. You can instantly review finance payment plans offers that you qualify for, and you'll never need to visit a branch to complete your application. Lending Club can finance $4,800 for Invisalign ® treatment. All financing payment plans feature an affordable fixed rate, which means your monthly payment will never increase. In addition, you can prepay your financed amount at any time and there's never a prepayment penalty or fee. With this type of dental financing plan, patients can break up the total cost of the procedure into a series of affordable monthly payments. The first thing people notice about you is your smile. Invisalign clear braces orthodontics uses a series of clear aligners that are custom-molded to fit you. The virtually invisible aligners gradually reposition your teeth into the desired smile. Step 1: Initial Invisalign® Visit - During the initial one hour visit, Dr. Arocha will evaluate for crowded teeth, gaps between teeth, overbite and discuss the course of moving your teeth with you. Dr. Arocha and the team would take bite impressions, photos of your teeth to send out to Invisalign for processing. Step 3: You receive your clear aligners in a few weeks. Step 4: How long does Invisalign take - You'll wear each set of clear aligners day and night for 2 weeks, removing them only to eat, drink, brush, and floss. Patients at our office, on average, take approximately 11-14 months to straighten their teeth. You'll visit the office every other month, or longer, to check the movement of your crowded teeth. Much less time is needed with Invisalign to check the progress of closing the gaps between teeth. Step 5: You've finished treatment! - When you're finished wearing each clear aligner in the series, your treatment may be complete and you may require upper and lower retainers of your choice. You can choose from fixed or removable retainers. Braces cost is between $4,600- $5,000 for a full case. Hygienically, the difference between Invisalign and braces is tremendous. Invisalign aligners are neither worn when eating nor drinking and are taken off when brushing and flossing. Whereas, traditional braces are fixed in the mouth and therefore trap food and are difficult to clean. Brushing and flossing are extra important when you have braces. That’s because there are so many places around your metal braces and wire for food to get stuck and plaque to build up. Flossing with braces is time-consuming and difficult. Flossing is required not only between the braces but also under the wires. To more easily floss under the wires, use a floss threader or orthodontic flosser. Braces need extra attention to protect your teeth from cavities, permanent staining, and gum disease. You should also take precautions to avoid damaging the braces. Even otherwise healthy foods, such as raw apples and carrots, can be problematic because their hard texture can damage the wires. To eat crunchy foods, cut them into small, bite-size pieces. As of 2018, both braces and Invisalign are effective treatment options in straighten teeth while improving your smile. The convenience and ease of use of the Invisalign system have made it the choice of over four million people. In fact, Invisalign has been effective in giving hundreds of thousands of people amazing new smiles. No metal wires or bands to irritate your mouth, and best of all, most people won't notice you're in treatment. Invisalign, the clear alternative to braces, has been chosen by about 5,000,000 people who want amazing smiles. There is an Invisalign cost calculator form Invisalign company. However, It is best to call our office (954) 432-7771 so we can perform a complimentary Invisalign insurance verification, better explain our payment plans and/or the different costs available. Invisalign® effectively corrects a wide variety of dental problems, from mild cases of crooked teeth to more difficult teeth correction like overbite, underbite, crossbite and open bite. Whether teeth have a wide gap, crowded or somewhere in between, Invisalign has affordable teeth straightening option. Whether your smile needs minor specialized improvements or more extensive adjustments, our preferred Invisalign dentist can certainly help. It's successful in treating overly crowded or widely spaced teeth in clinical most cases. It can also relieve more complex issues, including overbites, underbites, and even crossbites. In fact, we as an Invisalign certified dentist can use Invisalign clear aligners in all or part of just about any treatment plan. Because Invisalign uses clear plastic aligners to position and straightens teeth, you can keep your active lifestyle during treatment. Unlike braces, Invisalign aligners have no metal bands or wires to irritate your mouth. So go ahead and be as active as you like. Since Invisalign is removable, just take the clear aligners out for special events or if you're going to indulge in a sticky, gooey snack. Of course, you want to look great, at work, at school, with friends. Maybe you speak to groups or conduct meetings. You still can. Because Invisalign is clear and nearly invisible, most people will never know you're straightening your teeth - unless you tell them. And when your course of treatment has ended, you can feel more confident, whether in front of people or not. You're going to have a stunning smile. If you are considering tooth straightening, you may be nervous about the possibility of getting metal braces with wires and anchors and ligatures. Many adults had braces as a teen but were so embarrassed that they did not wear their retainers and ended up having their teeth migrate back into poor position. These people are generally good candidates for Invisalign, as are most people who are looking to correct a number of common dental conditions. This page gives some information about you be a possible candidate, but it cannot tell you whether Invisalign will work for you. The way to determine whether you are a candidate for Invisalign is by scheduling a consultation with a dentist. Invisalign Certified Provider serving Plantation and Fort Lauderdale. A way to learn more about Invisalign cost and treatment is to visit an Invisalign Certified provider, Dr. Max Arocha. 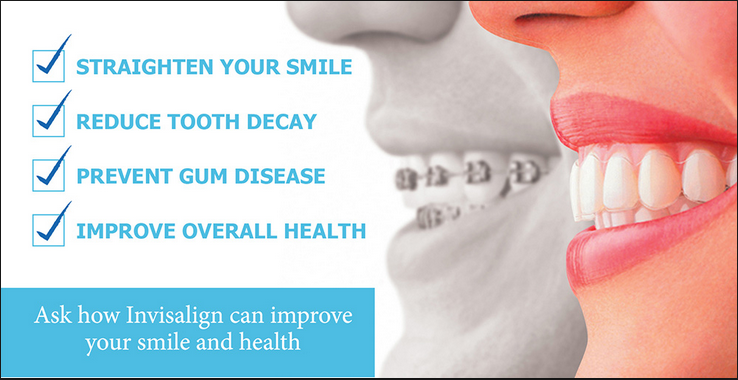 He can evaluate your specific needs and determine the best Invisalign treatment plan for you. We offer free consultations! So call today to learn more! As of 2018, we have had great results with correcting overbites since 2005. We would caution the patient to make sure that they seek out a certified and experienced Invisalign provider for this type of overbite cases. Many people use the term "overbite" interchangeably to mean both the vertical discrepancy of overbite and the horizontal discrepancy (the flaring out of the upper front teeth) of overjet. Both overbites and overjets can be corrected with Invisalign. However, there are some minor limitations, especially with the severe varieties, in few clinical cases 100% correction may not be possible. There is a high degree of variation in the levels of severity and in the amount of correction possible. As long as the patient is presented with possible options and limitations of each, they should be able to decide the best course of treatment for their individual situation. Invisalign is a fine treatment option that can be as effective as braces in many types of clinical cases. Invisalign is one of many options and like most other treatment options, there may be limitations. The length of treatment depends on the severity of your case and can only be determined by an Invisalign doctor. However, the average case takes about 10 to 12 months for adults. The other question is: How long does it take before you start seeing results? For most people, not long at all. It usually takes two to three months for most patients to notice results from Invisalign treatment and about three to four months for other people to notice results on your smile. We have a special way to protect and guaranty your Invisalign cost investment because predicting the way teeth may stay after treatment is completed can be challenging. Occasionally teeth might not stay in quite the right position, and many times a year or two after treatment teeth may slighly shift back. When this happens, we are here for you to make sure you are covered. As part of our "Invisalign Limited Guarantee", we are pleased to offer additional aligners at no charge for up to 3 years after treatment for selected invisalign cases. Invisalign aligners are composed of dental-grade polyurethane resin and have been approved by the Food and Drug Administration (FDA) after extensive clinical testing. The aligners do not contain Bisphenol-A (BPA) or phthalate, two agents often used in plastics and that have been associated with health risks. Unlike traditional braces, Invisalign relies on a transparent mouthpiece that gradually moves the teeth around without being as cumbersome or noticeable as metallic wires and brackets. While Invisalign is not a “holistic treatment,” it is an environmentally safe product and a product that is safe. There are no toxins to leach into your body and, in fact, Invisalign can help improve your whole body health: an improved bite alignment allows for better jaw and dental health, which can lead to better complete wellness for your entire body. However, there are some risks involved when you decide to have Invisalign treatment. Some of the risks include: Invisalign may cause discomfort with your teeth while they are moving. You may initially experience some mild scratched gums, cheeks and lips, mouth dryness, and speak with a lisp until getting used to the trays. It is possible for your teeth to not maintain their straightness when treatment has been completed. Therefore, it may be necessary for you to wear a retainer, at night time, for several years after having Invisalign treatment. The Invisalign treatment may increase the risk of TMJ and lead to, rare, possible allergic reactions. This question, in particular, is one of the most frequently Invisalign asked questions by patients who are wearing Invisalign trays. The easiest and best way to clean your Invisalign clear aligner is to take them off and brush them with a normal toothbrush and regular toothpaste every time you brush your teeth. You can use a soft toothbrush. Rinse under running water and brush until clean. After brushing and flossing your teeth you may clean aligners prior to each insertion. Never use denture cleaner or soak in alcohol or bleach. Additionally, it is not recommended to soak them in mouthwash; this may dull the aligners and can make the aligners more visible. Do not place aligners in boiling or hot water to clean. There is personal-sized ultrasonic cleaner available. These devices cause fine vibrations and waves to loosen material stuck to your aligners. When it comes to choosing the best Invisalign provider in 2016, like most dental needs, choosing the right dentist is an important decision. You want to choose a certified Invisalign dentist that you have a good rapport with, and can understand and provide the best treatment outcome you are looking for. Invisalign trained providers have achieved a significant level of experience in treating patients with the Invisalign procedure. In addition, some dentists have distinguished themselves with even higher experience and recognized as Preferred and Premier Preferred Providers. 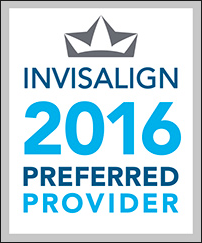 Look for a 2018 certified provider designation when choosing the right Invisalign provider for your initial consultation. The best Invisalign dentists are the one that has successfully treated many patients with this revolutionary treatment. A popular asked question about if metal braces are cheaper than Invisalign, the answer is generally yes. The actual cost of the option you choose varies based on how long you will be wearing them, but traditional braces may run slighly less money than Invisalign. However, there are many cases in which Invisalign is cheaper than braces since having braces generally require you to go in for adjustments about once every month. The orthodontist will adjust the wiring, which takes chair-time. In certain clinical cases, because braces is an older technology, it was designed to keep the braces fitted to your teeth entails a slighly more work on the part of the orthodontist. Braces are made from metal brackets that are connected by wires. They remain in place throughout the treatment. 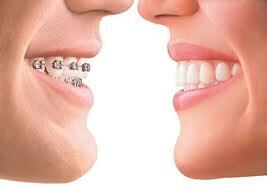 Metal braces require careful attention to oral hygiene. Some foods are also off limit as it could break a wire or bracket. The Invisalign system, on the other hand, is consists of a series of clear aligners that fit over your teeth. The aligners are removable for oral hygiene, meals, and special occasions. You are guaranteed an Invisalign doctor with experience. You can be assured that Preferred Provider doctors have received the best Invisalign training. Preferred Invisalign doctors can treat a variety of cases. The length of Invisalign treatment depends on the severity of your case and can only be determined by your doctor; however, the average case takes about 12 months for adults. Invisalign are worn for 21 hours each day. Invisalign serving Fort Lauderdale, Plantation, Hollywood, Davie, Sunrise, Deerfield Beach, Pompano Beach, Weston, Cooper City, Miami and Boca Raton.